In the United States, College entrance exams are required by many colleges in order for a person to enter their institute. Some of the entrance exams that are required are the SAT, the ACT, and the TOEFL. The exams test English and some test math and other subjects. Any person planning on taking any of these exams must know the area of studies each exam is going to test in order for them to prepare because each exam is different. For example there is the SAT (Scholastic Aptitude Test), which has two kinds; there is the SAT I and there is the SAT II. The SAT I is required by most colleges. It tests the persons knowledge in English, algebra, and geometry. The ACT (American College Testing) is another exam, which is somewhat different from the SAT I. The ACT subjects include English, math, and science. Another exam is the TOEFL (Test of English as a Foreign Language); nonnative English-speaking persons can take this exam. The TOEFL tests the person's ability in the English language only. The SAT II is different subject exams - mathematics, English, science, foreign languages, and history. This means that you can take an exam in subjects like chemistry, biology, and others. Some colleges require the applicants to take the SAT II in certain subjects. 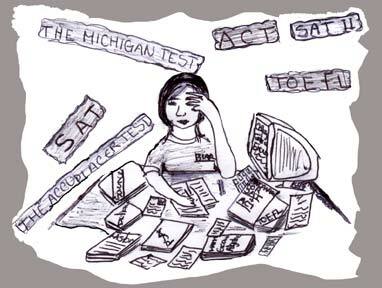 The Michigan Test is another test that is also for persons whose first language is not English. Montgomery College requires this test. The Michigan test includes a listening portion, a reading portion, and vocabulary. Students also have to write an essay. The Michigan Test is for students from other countries who have been in the U.S. for five years or less. The Accuplacer is another Montgomery College test. It is an English and math test. It is for students who are fluent English speakers. These test are taken mostly by seniors and juniors in high school planning on entering college after high school. But some students take the tests for practice starting in 9th grade. Are you confused about all these tests? Teachers may suggest what test you should take because some students may do better on certain tests than the others. For example some teachers recommend their students take the ACT if the student is strong in science. It is important to prepare for the exams before taking them. "With ACT your class notes are one of your stronger points, things you're doing in class now, because it is so closely related to it," said Sharon Williams, the College/Career Center Coordinator. Preparation is important because according to some high school students these tests are not easy. "They're hard because they have words that we don't understand or we don't know the definitions of," explains senior Ismael Ventura, who on June 7 took the SAT I for the first time. Now he's preparing to take it again for the second time. To help people who are going to take a test, there are many types of courses that can be taken to prepare for these exams. Schools like Montgomery Blair High School offer a semester SAT I prep-course which is free. There are also private institutes that offer a preparation course, but unlike the Blair High School course the students must pay for them. There are also other ways to prepare for these exams. One of the methods that can be used to prepare for these tests is to take a practice test. To take an ACT practice test can go to www.act.org. To get SAT practice materials a person could go to www.collegeboard.com or go to ask a counselor. At Blair High School there's an SAT practice test CD-ROM available for the students. There are also booklets with practice tests available at the Blair Career Center. Senior Thanh Chau is a senior who still hasn't taken the SAT I yet. Chau plans on taking the SATs in November and is hoping that it will help her get into the University of Maryland. Like Ventura, Chau also thinks that the SATs are difficult, especially the English part of the test. But she has been studying in order to do well on it. "I'm somewhat prepared," explained Chau. "I've been studying mostly for the English. I think the English is most difficult." A person who will take any of these tests must sign up for them and must pay for most of them. The SAT exams are administered seven times a year, in October, November, December, January, March, May, and in June. One way to register for the SATs is to register online at www.collegeboard.com or by picking a form from the Career Center and mailing it. It's important to register early because that way a person will have a better chance at taking the test in the place of their choice. The cost for the SATs is $28. The ACT is it's given six times a year, in September, October, December, February, April, and June. You also have to register for the ACT. Register online at www.act.com. The cost for the ACT is $26. The TOEFL is given throughout the year. It's better to register early because the test centers fill quickly. The cost for the TOEFL is $130. If a person is unable to pay for these exams there are ways that they can get the price reduced. Blair students can visit Blair's Career Center. The coordinator there will help them. "They have actually a waiver program, Ms. Williams said. "The income guideline for their waiver is extremely low, but what we will to do is request a waiver from our portion here for $65. Then request a waiver for the other half through the ETS organization that handles it. A person taking any of these exams should plan to take them more than once. Many schools look at the highest score a student gets on the tests.